Do they Double a Lot in the Swordfish Finals? Swordfish: Celebrating European Martial Arts. 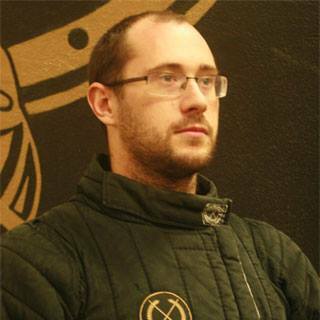 For some this is the pinnacle of the art, the most publicized and prestigious event in HEMA. For others it’s a glowing testament to a culture of sportification rolling over the art. And as this article is going to be published the week following, the livestream is probably still going to be a hot topic of discussion in the community. Some people have taken issue with the matches on the Swordfish finals due to a perceived high number of double hits. Let’s crunch some numbers and see if this is actually true. As always I’m using Bilateral Hits as my measure. This is when both fighters hit each other, whether it be in a double or afterblow tempo. This measurement allows us to compare tournaments with doubles and afterblows, to tournaments like Swordfish which lump it all together. What percentage of the time do you think that both fighters hit each other (on average) during the Swordfish finals? This may seem silly, but it’s actually an important experiment for yourself. We all develop a qualitative impression as we watch a match, whether we think it’s good or bad. It may be interesting to learn how well you are ‘calibrated’ to assess these things. So commit to a number, write something down! It will make this article more interesting, trust me. I’ve looked at the 2015, 2016, 2017 & 2018 finals matches to get an overall picture of the finals. In ANY tournament it’s possible for two fighters to have a supremely ugly or sublimely clean match. Given that the finals are only two matches out of dozens (if not hundreds) of matches that go on in a tournament, it’s difficult to get an adequate sample size. Furthermore, I am just going by the judges’ calls. This takes my own subjectivity out of the equation and reflects the hit threshold and judges’ abilities of the tournament itself. After all, when I’m crunching numbers for score sheets at other events I don’t exactly get to exercise judgement on why they recorded what they did! Why didn’t I go earlier than 2015? Because judge calls aren’t as easy to see in those videos. In 2014 the audio did not pick up the director’s calls very well, nor did the camera zoom out to see the judges’ calls. As I didn’t feel like going back and forth on the same exchange multiple times to make sure I can tell the call, I felt that it was a good cut-off point. 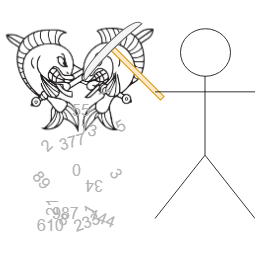 First and foremost on everyone’s minds when they think of Swordfish livestreams is the longsword tournament. So that’s where we start. Over the last 4 years I have recorded 253 total exchanges (I occasionally can’t make one out on the video), combined between Open and Women. So, yes. There is a whole lot of both fighters hitting each other. 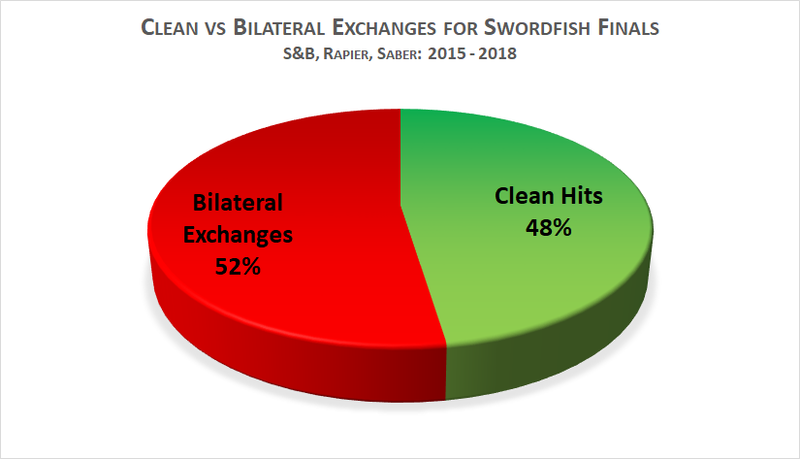 In fact, Bilateral Hits actually happen more often than Clean Exchanges! That’s not great breakdown. Put in ratio format it becomes 1.14 : 1. There is more than one bilateral exchange for every clean one. There are two ways of looking at this, by exchanges or by matches. For instance, if two very doubly fighters go out there and get 30 exchanges, while a clean match only records a dozen, the doubly match will more heavily influence the average. If we instead look at it on a match by match basis also shows that very rarely do matches do better than having over half of their hits as bilaterals. Each bar is a match (in random order). Horizontal line represents the average. We can see that only a handful of matches drop below the 50% barrier. And there is only a single match which I can call exceptionally clean (14% BpE). Bottom Line: Based on past trends, a Swordfish longsword finals match is more likely to two bilateral hits for every clean hit than it is to have more clean hits than bilaterals. That single good match was enough to shift the whole average from 53% to 51%. When you average the individual match BpE you get 52%, almost the same number as summing all the exchanges. * for some definitions of fun. Some people are probably triggered that I’m talking about longsword first. It’s already the glory hog. And while it’s nicer to analyse (due to Open + Women’s there are twice as many matches to sample), I definitely won’t let the other weapons be neglected. A line graph instead of a bar! Each point is a match, once again in a random order. First of all: we have to keep this in perspective. The livestream finals are only a small fraction of the matches in the tournament, so we can only extrapolate so much to the rest of the event. But if someone who had told you that they didn’t double that often in the finals now tells you that the pools are much better… well you can probably guess how good their intuition for these things is. 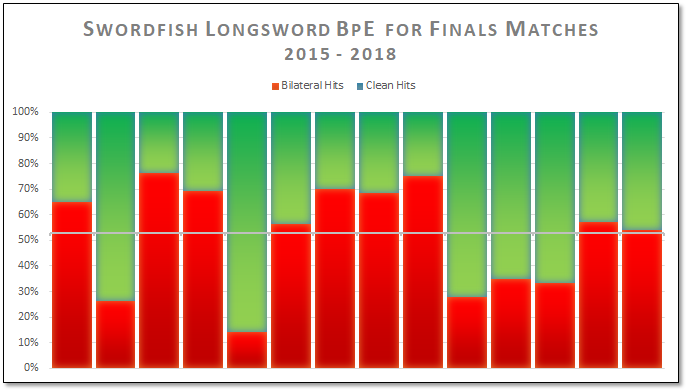 Hit Threshold – Swordfish has a much lower threshold for cut quality/edge alignment than a lot of tournaments I have data to compare against. So even if you have two fighters doing the exact same actions, if the quality standards throw out a bunch of the hits you will likely have fewer exchanges where both fighters have scored valid hits. Afterblow Window – If you give fighters more time to land an afterblow, you are likely to see more of them. Swordfish uses an afterblow which, given my completely anecdotal and unsubstantiated experience, I would describe as on the long end of afterblow windows. Which basically means that I don’t think you will find competitions which use a longer time period, and there are definitely ones which use a shorter one. 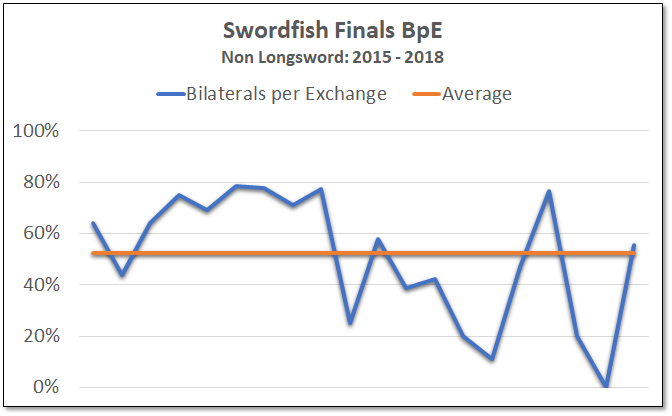 To wrap it all up, I would say the number of Bilateral Hits in the Swordfish finals is a problem that the event organizers should be concerned about. It’s not a simple situation to address. Before anyone gets on their soapbox, take some time to consider all the factors (like meshing fighter cultures from around the world) that a lot of events don’t have to deal with. But the first step to making things better is to talk about them. Here are the raw numbers I’ve recorded. You’ll notice that I haven’t included which match is which. That’s because I want people to focus on the finals as a whole, not an individual fighter who could have been having a good or bad day. Survive the Pools and Fence the Finals?